New Charity Partnerships with GBP Estates - H.A.D. We are extremely honoured to be a Charity Partner with GBP Estates. 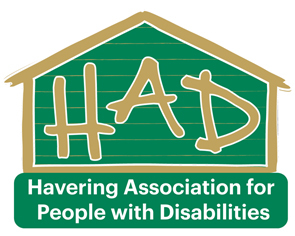 Already this year they have amazed us with their ideas, energy and support they are offering to provide Havering Association for People with Disabilities for the coming year. 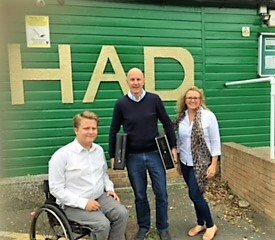 All GBP Estates staff are taking the time to become Ambassadors for Havering Association for People with Disabilities, learning about our services to enable them to promote to potential clients. Providing their time already attending planning meetings sharing their ideas and suggestions for events. Connecting us with their range of business network to enable us to gain the best deals and opportunities available. Promoting our services through social media, their website, in their head office, and on the signature of all the emails issued a whopping 2500 (approx.) a week. Excited for the New Year and a successful partnership, thank you for choosing us. If you would like to find out more about GBP information about the services provided by GBP see press release from Paul Ziff, The Group Manager or check out their website. GBP Estates is an independent Estate Agent, part of the GBP Estates established in 2009 by Gary Taylor and Julie James. The group has steadily grown from its financial service roots, incorporating property management and property sales, offering the solution to many varied property problems. Through their many connections, continuous land and development enquiries made it clear that there was an opportunity and a niche that GBP could explore and grow the business further. The Land and Development department is now an important part of our growing business, headed by Paul Ziff. Projects have been established and sold throughout our core areas in Essex and London, but recent developments have also seen successfully completed projects in Kent, Bristol and Wales. One such development completed was a new build block of 14 luxury apartments, in Watford, Herts with a GDV approaching £6,000,000. Residential sales is a major part of the business which has grown rapidly over recent years and is overseen by our sales manager Kevan Wimborne, who’s experience in the property industry spans almost 40 years. We now have a competitive and pro-active sales department using the latest technology and social media to keep GBP Estates moving forwards. 2018 has seen a real growth in the number of properties listed and sold by the company, with more and more clients preferring GBP’s hands-on and personal approach to selling. GBP Estates portfolio of property ranges from first time buyers and investors flats and apartments to family luxury homes and country bungalows. The Lettings and Property Management side remains a bedrock to the company with many new landlords added to our growing portfolio. Amy Wood receives many accolades from landlords and tenants alike for her professionalism and attention to detail in this department. GBP Estates have also welcomed Gary Rosenbaum to grow the Commercial and Acquisitions department. His many years of experience and contacts throughout the area are an invaluable service to many business owners. GBP Estates are looking forward to many years of enhancing the whole of our business and growth in the future.